Router Projects for every room in the house! The Step Stool is excellent to give that extra reaching room for the shop, kitchen or bathroom. 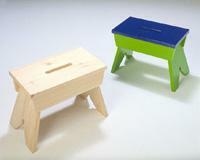 Angle legs prevent the stool from tipping. Accent your living room with this Sofa Table and Tear Drop Table! Bob and Rick show how to make decorative identical furniture. The office Desk Set and the Roll Up Box are conversation pieces. For the bedroom a Vanity Stool with heart shaped joinery, a Jewelry Box or a Blanket Chest make beautiful accent furnishings. 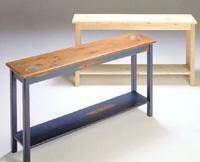 The Folding Table uses a wood groove in the rail to facilite the folding action. This is from the 1940 era before television, but it makes a great TV table now. 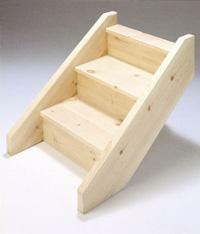 Bob and Rick also share some great tips on how to build stairs. This shop stool works equally well in the kitchen, bathroom, playroom or laundry area. The angled legs prevent tipping, the hand hole and lightweight allow easy mobility, and the height is ideal for accessing that area that was just out of reach. 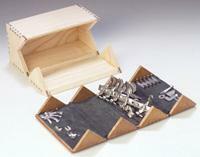 You may also use it in the shop to set a project off the floor for gluing or assembly. An 1880 vintage storage box for sewing machine parts is the original for this interesting roll-up box. An added feature is making walnut splined box joints with your router to catch your eye. Use zebra wood, pine or contrasting woods and heart-shaped joinery for that special vanity stool your spouse will love. Top it with a padded cushion for a sure winner! Hardware installation requires some creative thinking and easy routing. Decorate tops, sides and bases to make truly unusual box projects. This antique, hand painted sofa table holds a lamp behind that sofa positioned in the center of the living room. It is the right height to come to the top of the sofa back and can be finished to coordinate with the room decor. Use box joints in walnut and ash to rout a desk set to hold papers, pens, pads and paper clips. Organize your desk at home or the office with this interesting routed wood accessory. 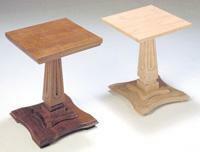 �Tear drop� describes the leg design in this occasional table. 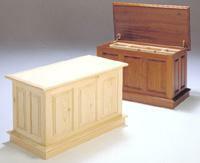 Shop made fixtures ensure easy routing to produce this decorative piece of furniture.